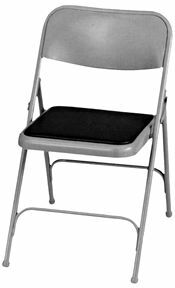 Hepburn Superior prides itself in the durability and practicality of its assortment of folding chairs and stack chairs. These exclusive styles all have the same dependable quality features and all offer comfort at a low price. 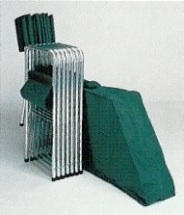 Poly stack chair with chrome frame. *Packed 4 per carton. Minimum order 1 carton. These exclusive styles all have the same dependable quality features and all offer incredible comfort at a low price. Available in oak, cherry or fruitwood finishes with your choice of exclusive vinyl covers or designer fabrics for upholstery. Long wearing and easy to maintain. Open/close in one easy motion. Extra roomy seat is 16"D x17"W. Spade shaped for greater comfort. Chair glides come with all Hepburn Superior chairs at no extra charge. 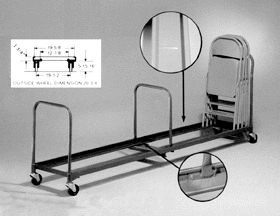 This folding chair is a modification on the tried and true A-Frame folding chair. 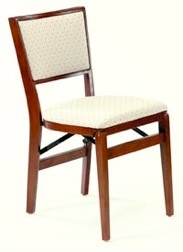 With solid hardwood legs and supports this chair has a padded vinyl back and seat. The folding mechanism is made from steel to provide years of use. 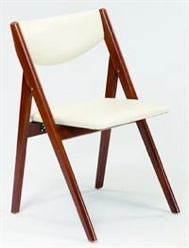 This transitional folding chair has a retro flair in its curved upholstered back and backpost lines. The chair is constructed of solid hardwood with a steel folding mechanism and padded upholstered seat. 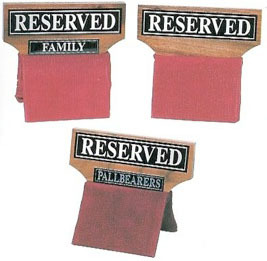 31.75"High / 17.5"Wide / 19.25" Deep-open / Folded Depth 7.25" / Seat Height 18.75"
Choose from clear Lucite with leaded ears, which form-fit onto chairs or pews, covered with maroon corduroy or cloth style. 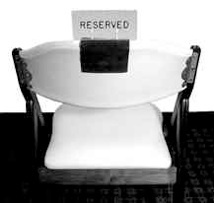 "Reserved" seen both ways along with a graceful leaf design. Letters are 1-1/2" high. Maroon satin & gold lettering. 11-3/4" wide. 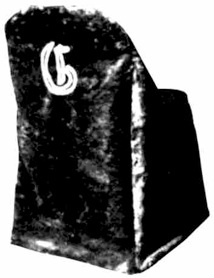 Clear Lucite top, slip proof corduroy bottom. Adjusts to contour of chair or pew. 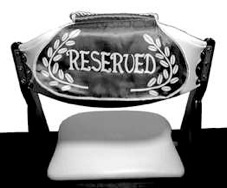 B245/301 SEAT SIGN "RESERVED FAMILY"
Add elegance and good looks to ordinary folding chairs with Custom Chair Covers. Made of 100% acrylic fabric. Please specify what type of chair used. CUSTOM MONOGRAMMING WITH NAME AND/OR INITIAL IS AVAILABLE. 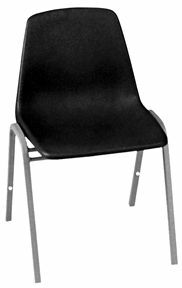 Chair bags are tailored to fit all types of folding chairs and are designed to hold four to six chairs. Made from No. 8 green canvas, two-inch webbing and webbed handles add strength and rigidity. All corners are reinforced with webbing. PLEASE SPECIFY STYLE OF CHAIR TO BE USED IN BAGS. 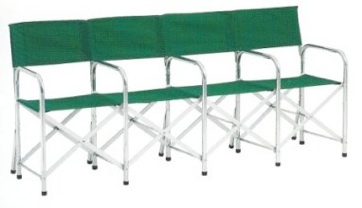 Double strength aluminum - green canvas seats and backs - effortless handling in arranging seating and storage.